Thomas Bonomo and Dean Holly launched Thomas Dean & Co in 2009. Both men come from a superlative apparel background and this experience is detailed in their collections. Of course the men's collegiate collection is my favorite from their line. 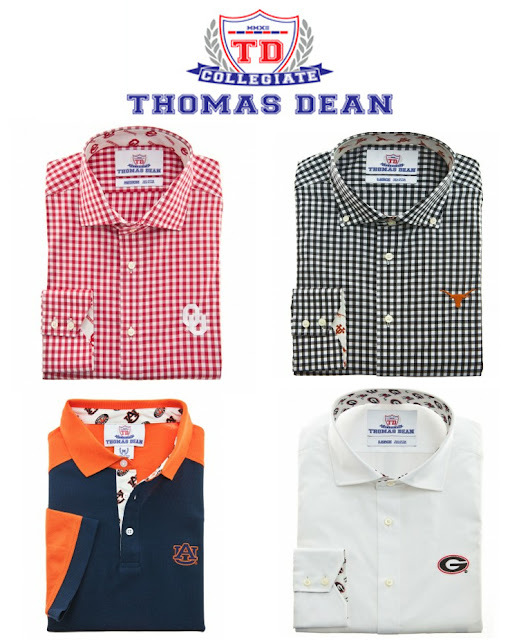 The detailing on their button collar shirts is what sets TD apart from other men's clothing lines. Teams represented include; Texas, Oklahoma, LSU, Arkansas, Carolina, Georgia, Alabama, Auburn, Ole Miss and SMU. If you live in the DFW area, my friends at Gameday Cloth carry the line.